It combines the production of biofuel with a special technology designed to capture the facility's carbon dioxide emissions. It's a fledgling version of a much bigger geoengineering strategy that some experts hope could reduce global emissions by removing carbon dioxide from the atmosphere. It's known as "negative emissions." The idea calls for massive plantations of trees and other crops to draw carbon dioxide out of the air. The trees could then be harvested for the production of energy or biofuels, with carbon capture technology used to sequester their emissions. The whole process would be carbon-negative. This could theoretically cool the climate. But it would have to be done at a massive scale. It's still almost an entirely hypothetical concept. But it has rapidly risen to prominence as a strategy for meeting the world's climate targets established under the Paris Agreement. It's called "bioenergy with carbon capture and storage," or BECCS. Consider this. The Intergovernmental Panel on Climate Change, in its Fifth Assessment Report, presented more than 100 modeled scenarios that it said had a high likelihood of keeping global temperatures within 2 degrees Celsius of preindustrial levels. Nearly all of them assumed that negative emissions technology would be viable and widely used, particularly BECCS. But there's a major problem: Research increasingly suggests that the process is not feasible at the scale necessary to make a real dent in global climate goals — at least, not without causing massive environmental or social disruptions. If that's the case, some experts worry that the models could mislead policymakers into believing there's a definite "out" if global emissions don't fall fast enough in the future. It's a growing concern among international scientific bodies, as tensions grow between the modeled scenarios involving "negative emissions" and newer research. Just this month, the European Academies Science Advisory Council released a report warning against unrealistic assumptions about carbon dioxide removal, or CDR. "Current scenarios and projections of CDR's future contribution to CDR which allow Paris targets to be met ... appear rather optimistic on the basis of current knowledge, and should not be seen as offering a realistic pathway to meeting Paris Agreement targets," the report states. A study published in the journal Nature Climate Change in January is among the latest to raise doubts. It suggests that the large-scale deployment of BECCS — which calls for massive, managed plantations of trees — would likely require an unsustainable use of land, water and other resources. "Our main message is that really relying on BECCS via the land system is a very high risk to the Earth system in general," said the paper's lead author, Vera Heck of the Potsdam Institute for Climate Impact Research in Germany. The research relies on the idea of "planetary boundaries," a concept first developed by scientists in 2009. It describes nine environmental thresholds, from freshwater use and land changes to ocean acidification. Pushing any of these boundaries too far, the framework suggests, could result in irreversible consequences for Earth systems. Climate change itself is listed as one of the planetary boundaries. 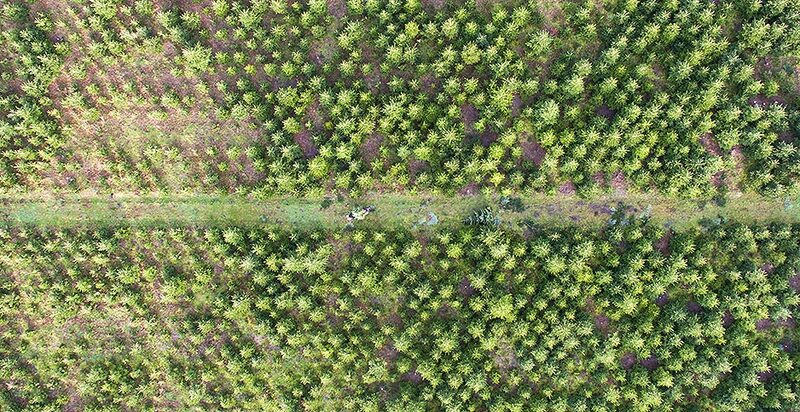 Planting vast tracts of trees at the scale necessary to avoid dangerous climate change could help safeguard one planetary boundary, but it would likely threaten others in the process. If it's scaled down to safeguard the other planetary boundaries, its influence on the global climate becomes insignificant. Other recent studies came to similar conclusions. One paper published last year in Earth's Future examined the technology's potential to keep temperatures within a 2 C threshold under a variety of emissions scenarios. If emissions remained on a business-as-usual trajectory, the sheer scale of BECCS plantations would obliterate "virtually all natural ecosystems," the study says. Under more moderate scenarios, potentially prohibitive amounts of land or water could still be required. At most, BECCS could provide support for aggressive climate mitigation, but it's probably not viable at very large scales, the study found. Environmental concerns aside, other researchers have questioned carbon capture and storage, or CCS, technology. It would need to accompany BECCS bioenergy facilities. CCS has been used at small scales in a few dozen facilities around the world, including the Decatur biofuel plant. But it has yet to be proved at larger scales. "There is real worry that BECCS is just too land intensive AND requires CCS to actually work at scale!" Daniel Kammen, an energy professor at the University of California, Berkeley, and a former climate science envoy for the State Department, said in an email to E&E News. "Both are going to be very tough." There are other factors to consider. A recent study in the Proceedings of the National Academy of Sciences points out that nations need to have the resources to transport harvested biomass to processing facilities if they're going to use it for energy. And once it's been burned, these nations must also have access to locations suitable for storing the captured carbon dioxide underground. Environmental concerns aside, transportation and storage limitations can significantly reduce a nation's BECCS potential. In the United States, for instance, the research suggests that only about a third of available biomass resources could actually be utilized for BECCS, once these factors are accounted for. BECCS isn't the only negative emissions strategy that's been bouncing around. Scientists have also suggested that special minerals, land and forest management plans, and machines could be used to pull carbon dioxide out of the air. But BECCS is used the most in models. The concept began to circulate among scientists about 20 years ago, and in the early 2000s, research teams began to incorporate it into models used to investigate future climate scenarios. Since then, it's become a feature in a majority of the modeled scenarios that assume the 1.5 C or 2 C climate target is met. The few scenarios that don't assume significant negative emissions illustrate the growing difficulty of meeting global climate goals without them. Humans as a species can likely emit less than an additional 1 trillion tons of carbon dioxide and still have a decent chance of meeting a 2 C climate target. With about 40 billion tons of carbon dioxide still pouring into the atmosphere each year, that threshold would blow by in 25 years without immediate global reductions. Some of these scenarios suggest that global emissions should have already peaked for there to be hope of meeting a 1.5 C or 2 C target. It's likely that isn't the case (Climatewire, Nov. 13, 2017). With the clock ticking, there's growing debate about whether it's still possible to meet a 2 C target — let alone 1.5 C — without first overshooting and then artificially bringing global temperatures back down. But some experts suggest that growing uncertainties about negative emissions technologies have underscored the importance of slowing temperature increases without geoengineering. In a 2016 comment published in Science, researchers Glen Peters and Kevin Anderson warned against making unrealistic assumptions about negative emissions technologies. "If we rely on these and they are not deployed or are unsuccessful at removing CO2 from the atmosphere at the levels assumed, society will be locked into a high-temperature pathway," they said. In a 2017 perspective also published in Science, Stanford University researchers Christopher Field and Katharine Mach pushed for similar caution. "I haven't seen any literature yet, but I suspect in the next year or two ... we'll start to see a lot more scenarios using lower levels of bioenergy with CCS," Peters, a researcher at the Center for International Climate and Environmental Research, said in an interview with E&E News. As experts call for greater caution in the assumptions being made about future technology, modelers may explore more scenarios in which negative emissions are less aggressively deployed. The IPCC's reports are intended to help inform policymakers about the amount of carbon dioxide they can emit and still meet global climate targets — and thus how quickly they need to be reducing emissions now. The modeled scenarios illustrate an array of ways the world can still meet those goals, and negative emissions are included as possible ways to help. The scale of the technology required depends on the scenario and to what extent it assumes policymakers are reducing greenhouse gas emissions now. So it could be argued that the climate scenarios are only hypothetical, and policymakers are free to use their judgment about the state of the technologies they explore when planning their emissions reduction efforts. But there's also the risk that policymakers could look at those scenarios and assume the lowest levels of mitigation and the highest levels of future geoengineering could be successful. So they skip immediate carbon reductions. "They're not just some theoretical scenarios that indicate how we get to 2 degrees, but actually used to guide policy," Peters said. "If you don't have negative emissions in the scenarios, then that would bring mitigation forward." That said, Peters generally falls into the camp of researchers who assume some level of negative emissions will be required to stay within 2 C. The question, he says, is how much. While BECCS is dominantly favored by the climate models, there are many other potential negative emissions technologies. They are also largely hypothetical. It's possible that many different carbon dioxide removal tactics could be combined at relatively small scales and add up to have a big influence on the globe. That's something researchers are willing to consider. The key, they say, is to continue aggressively reducing emissions now to prepare for the worst, while also investing in continued geoengineering research, in case some of these technologies have a chance at becoming useful in the future. The research increasingly suggests that BECCS, on its own, is likely not the climate savior some scenarios make it out to be. But it could be one small part of a much larger suite of different strategies employed in the future. "We should look at all types of technologies," Peters said. "They all have characteristics, different strengths and weaknesses. So we should be looking at all of them, which is not currently done in the scenarios."